Chief executive officers ordinarily don’t trash talk their competitors in front of Congress. Elon Musk is no ordinary CEO. The billionaire wants to break into a $70 billion Pentagon satellite launch market monopolized by a Lockheed Martin Corp.- Boeing Co. joint venture. 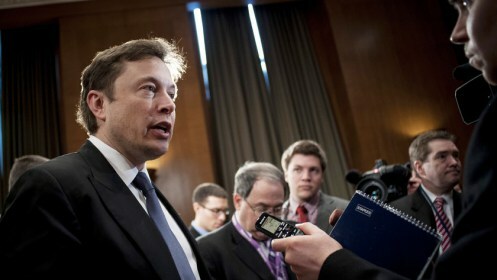 Testifying before U.S. lawmakers on March 5, he warned that the team’s dependence on Russian rocket engines poses supply risks. Musk’s remarks underlined concerns about U.S. reliance on Russia in space, which have been heightened by the crisis in Ukraine. More than four decades after landing the first man on the moon, the U.S. finds itself in a humble position: It pays Russia for rides to the International Space Station and uses its engines to launch military and spy satellites. When I started working for Doug Casey almost 10 years ago, I probably knew as much about investing as the average Joe, but I now know that I knew absolutely nothing then about successful speculation. Learning from the international speculator himself—and from his business partner, David Galland, to give credit where due—was like taking the proverbial drink from a fire hose. Fortunately, I was quite thirsty. You see, just before Doug and David hired me in 2004, I’d had something of an epiphany. As a writer, most of what I was doing at the time was grant-proposal writing, asking wealthy philanthropists to support causes I believed in. After some years of meeting wealthy people and asking them for money, it suddenly dawned on me that they were nothing like the mean, greedy stereotypes the average American envisions. It’s quite embarrassing, but I have to admit that I was surprised how much I liked these “rich” people—not for what they could do for me, but for what they had done with their own lives. Most of them started with nothing and created financial empires. Even the ones who were born into wealthy families took what fortune gave them and turned it into much more. And though I’m sure the sample was biased, since I was meeting libertarian millionaires, these people accumulated wealth by creating real value that benefited those they did business with. My key observation was they were all very serious about money—not obsessed with it, but conscious of using it wisely and putting it to most efficient use. I greatly admired this; it’s what I strive for myself now. But I’m getting ahead of myself. The reason for my embarrassment is that my surprise told me something about myself; I discovered that I’d had a bad attitude about money. This may seem like a philosophical digression, but it’s an absolutely critical point. Without realizing that I’d adopted a cultural norm without conscious choice, I was like many others who believe that it is unseemly to care too much about money. I was working on saving the world, which was reward enough for me, and wanted only enough money to provide for my family. And at the same instant my surprise at liking my rich donors made me realize that—despite my decades of pro-market activism—I had been prejudiced against successful capitalists, I realized that people who thought the way I did never had very much money. It seems painfully obvious in hindsight. If thinking about money and exerting yourself to earn more of it makes you pinch your nose in disgust, how can you possibly be effective at doing so? Well, you can’t. I’m convinced that while almost nobody intends to be poor, this is why so many people are. They may want the benefits of being rich, but they actually don’t want to be rich and have a great mental aversion to thinking about money and acting in ways that will bring more of it into their lives. So, in May of 2004, I decided to get serious about money. I liked my rich friends and admired them all greatly, but I didn’t see any of them as superhuman. There was no reason I could not have done what any of them had done, if I’d had the same willingness to do the work they did to achieve success. Lo and behold, it was two months later that Doug and David offered me a job at Casey Research. That’s not magic, nor coincidence; if it hadn’t been Casey, I would have found someone else to learn from. The important thing is that had the offer come two months sooner, being a champion of noble causes and not a money-grubbing financier, I would have turned it down. I’m still a champion of noble causes, but how things have changed since I enrolled in “Casey U” and got serious about learning how to put my money to work for me, instead of me having to always work for money! Instead of asking people for donations, I’m now the one writing checks (which I believe will get much larger in the not-too-distant future). I can tell you this is much more fun. How did I do it? I followed Doug’s advice, speculated alongside him—and took profits with him. Without getting into the details, I can say I had some winning investments early on. I went long during the crash of 2008 and used the proceeds to buy property in 2010. I took profits on the property last year and bought the same stocks I was recommending in the International Speculator last fall, close to what now appears to have been another bottom. In the interim, I’ve gone from renting to being a homeowner. I’ve gone from being an investment virgin to being one of those expert investors you occasionally see on TV. I’ve gone from a significant negative net worth to a significant nest egg… which I am happily working on increasing. And I want to help all our readers do the same. Not because all we here at Casey Research care about is money, but because accumulating wealth creates value, as Doug teaches us. It’s impossible, of course, to communicate all I’ve learned over my years with Doug in a simple article like this. I’m sure I’ll write a book on it someday—perhaps after the current gold cycle passes its coming manic peak. Still, I can boil what I’ve learned from Doug down to a few “secrets” that can help you as they have me. I urge you to think of these as a study guide, if you will, not a complete set of instructions. As you read the list below, think about how you can learn more about each secret and adapt it to your own most effective use. Secret #1: Contrarianism takes courage. Everyone knows the essential investment formula: “Buy low, sell high,” but it is so much easier said than done, it might as well be a secret formula. The way to really make it work is to invest in an asset or commodity that people want and need but that for reasons of market cyclicality or other temporary factors, no one else is buying. When the vast majority thinks something necessary is a bad investment, you want to be a buyer—that’s what it means to be a contrarian. Obviously, if this were easy, everyone would do it, and there would be no such thing as a contrarian opportunity. But it is very hard for most people to think independently enough to risk hard-won cash in ways others think is mistaken or too dangerous. Hence, fortune favors the bold. Secret #2: Success takes discipline. It’s not just a matter of courage, of course; you can bravely follow a path right off a cliff if you’re not careful. So you have to have a game plan for risk mitigation. You have to expect market volatility and turn it to your advantage. And you’ll need an exit strategy. The ways a successful speculator needs discipline are endless, but the most critical of all is to employ smart buying and selling tactics, so you don’t get goaded into paying too much or spooked into selling for too little. Secret #3: Analysis over emotion. This may seem like an obvious corollary to the above, but it’s a point well worth stressing on its own. To be a successful speculator does not require being an emotionless robot, but it does require abiding by reason at times when either fear or euphoria tempt us to veer from our game plans. When a substantial investment in a speculative pick tanks—for no company-specific reason—the sense of gut-wrenching fear is very real. Panic often causes investors to sell at the very time they should be backing up the truck for more. Similarly, when a stock is on a tear and friends are congratulating you on what a genius you are, the temptation to remain fully exposed—or even take on more risk in a play that is no longer undervalued—can be irresistible. But to ignore the numbers because of how you feel is extremely risky and leads to realizing unnecessary losses and letting terrific gains slip through your fingers. Secret #4: Trust your gut. Trusting a gut feeling sounds contradictory to the above, but it’s really not. The point is not to put feelings over logic, but to listen to what your feelings tell you—particularly about company people you meet and their words in press releases. “People” is the first of Doug Casey’s famous Eight Ps of Resource Stock Evaluation, and if a CEO comes across like a used-car salesman, that is telling you something. If a press release omits critical numbers or seems to be gilding the lily, that, too, tells you something. The more experience you accumulate in whatever sector you focus on, the more acute your intuitive “radar” becomes: listen to it. There’s nothing more frustrating than to take a chance on a story that looked good on paper but that your gut was warning you about, and then the investment disappoints. Kicking yourself is bad for your knees. As a speculator, investor, or really anyone who buys anything, you have to assume that everyone in business has an angle. Their interests may coincide with your own, but you can’t assume that. It’s vital to keep in mind whom you are speaking with and what their interest might be. This applies to even the most honest people in mining, which is such a difficult business, no mine would ever get built if company CEOs put out a press release every time they ran into a problem. A mine, from exploration to production to reclamation, is a nonstop flow of problems that need solving. But your brokers want to make commissions, your conference organizers want excitement, your bullion dealers want volume, etc. And, yes, your newsletter writers want to eat as well; ask yourself who pays them and whether their interests are aligned with yours or the companies they cover. Secret #6: The trend is your friend. No one can predict the future, but anyone who applies him- or herself diligently enough can identify trends in the world that will have predictable consequences and outcomes. If you identify a trend that is real—or that at least has an overwhelming amount of evidence in its favor—it can serve as both compass and chart, keeping you on course regardless of market chaos, irrational investors, and the ever-present flood of bulshytt. Knowing that you are betting on a trend that makes great sense and is backed by hard data also helps maintain your courage. Remember; prices may fluctuate, but price and value are not the same thing. If you are right about the trend, it will be your friend. Also, remember that it’s easier to be right about the direction of a trend than its timing. Secret #7: Only speculate with money you can afford to lose. This is a logical corollary to the above. If you bet the farm or gamble away your children’s college tuition on risky speculations—and only relatively risky investments have the potential to generate the extraordinary returns that justify speculating in the first place—it will be almost impossible to maintain your cool and discipline when you need it. As Doug likes to say; it’s better to risk 10% of your capital shooting for 100% gains than to risk 100% of your capital shooting for 10% gains. Secret #8: Stack the odds in your favor. Given the risks inherent in speculating for extraordinary gains, you have to stack the odds in your favor. If you can’t, don’t play. There are several ways to do this, including betting on People with proven track records, buying when market corrections put companies on sale way below any objective valuation, and participating in private placements. The most critical may be to either conduct the due diligence most investors are too busy to be bothered with, or find someone you can trust to do it for you. Secret #9: You can’t kiss all the girls. This is one of Doug’s favorite sayings, and though seemingly obvious, it’s one of the main pitfalls for unwary speculators. When you encounter a fantastic story or a stock going vertical and it feels like it’s getting away from you, it can be very, very difficult to do all the things I mention above. I can tell you from firsthand experience, it’s agonizing to identify a good bet, arrive too late, and see the ship sail off to great fortune—without you. But if you let that push you into paying too much for your speculative picks, you can wipe out your own gains, even if you’re betting on the right trends. You can’t kiss all the girls, and it only leads to trouble if you try. Fortunately, the universe of possible speculations is so vast, it simply doesn’t matter if someone else beats you to any particular one; there will always be another to ask for the next dance. Bide your time, and make your move only when all of the above is on your side. These are the principles I live and breathe every day as a speculator. The devil, of course, is in the details, which is why I’m happy to be the editor of the Casey International Speculator, where I can cover the ins and outs of all of the above in depth. Right now, we’re looking at an opportunity the likes of which we haven’t seen in years: thanks to the downturn in gold—which now appears to have subsided—junior gold stocks are still drastically undervalued. My team and I recently identified a set of junior mining companies that we believe have what it takes to potentially become 10-baggers, generating 1,000%+ gains. If you don’t yet subscribe, I encourage you to try the International Speculator risk-free today and get our detailed 10-Bagger List for 2014 that tells you exactly why we think these companies will be winners. Click here to learn more about the 10-Bagger List for 2014. Whatever you do, the above distillation of Doug’s experience and wisdom should help you in your own quest.